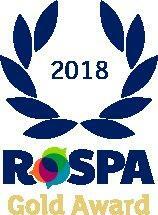 Speedy has won a RoSPA Gold Award for the 4th year in succession. We have been rewarded for achieving a very high level of safety performance, demonstrating well developed occupational health and safety management systems. We have managed to reduce our year end figure of 0.11 RIDDOR accidents per 100,000hrs worked vs 0.14 last year. Our carbon intensity figure has significantly reduced to 5.95C02 tons compared with 6.83 last year. Throughout 2017 we managed to raise 40k for our charities and communities.